Online Registration closes Friday, May 25 at 6:00 pm. Onsite registration begins at 4:30 pm on Race evening downtown Delaware. Join us and celebrate the "unofficial" arrival of Summer on Memorial Day weekend for the exciting 5th annual New Moon Half & Quarter Marathon AND the Crescent Moon 5K. The event kicks off fun summer evenings with a Half Marathon (13.1 miles), Quarter Marathon (6.55 miles) and the Crescent Moon 5K (3.1 miles). 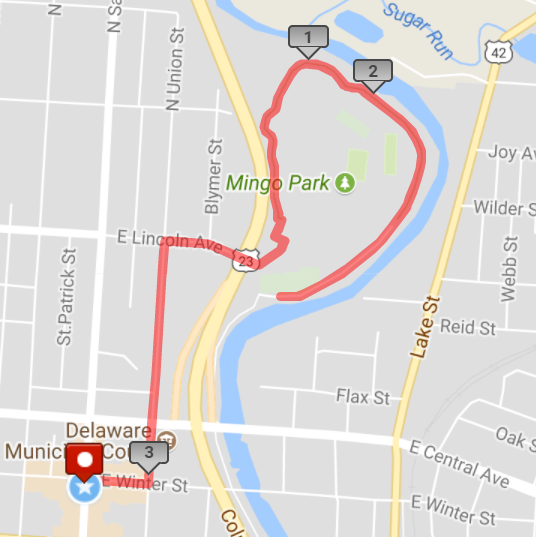 All three races, which begin and end in the heart of downtown Delaware, Ohio are open to runners and walkers. The New Moon is a party and celebration of all that is fun on great summer nights - including a festive post-event Celebration Block Party for you and all your friends and family. 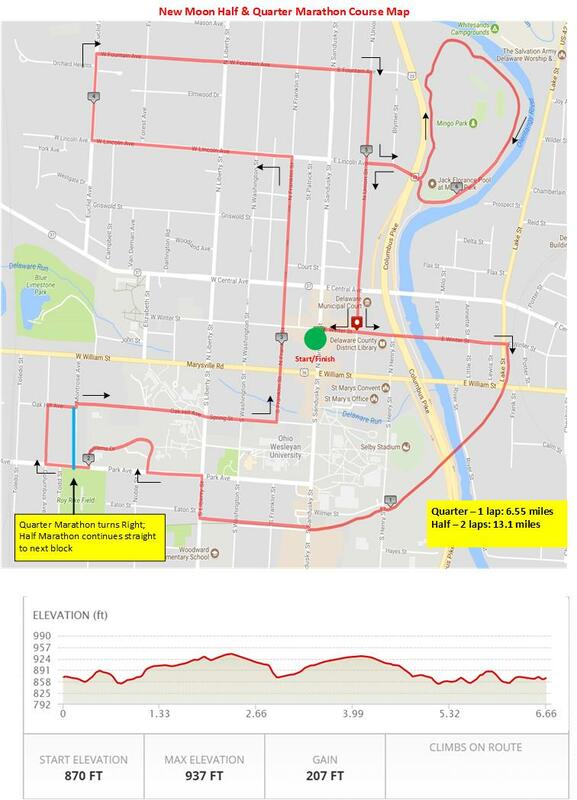 The urban run course starts directly in the downtown of Delaware, takes you through historic business district, the neighborhoods that make up the city, through the campus of Ohio Wesleyan University, around the beautiful Mingo Park and alongside the Olentangy River, to an exciting downhill finish back at the heart of downtown. The New Moon Half & Quarter Marathon and Crescent Moon 5K is the must-do running and walking event of the summer. Who can participant? You. We encourage runners and walkers of all shapes, sizes and abilities to participate. The course is open and fully supported for three and a half hours. Walker must be able to walk at an approximately 15:30 pace to complete the half marathon. Custom offical New Moon finishers Medal for the Half, Quarter & 5K. Separate medals for separate distances! The course is a 6.55 mile loop through the heart of Delaware. The Quarter Marathon is one loop then finish, the Half Marathon is two loops and then finish. 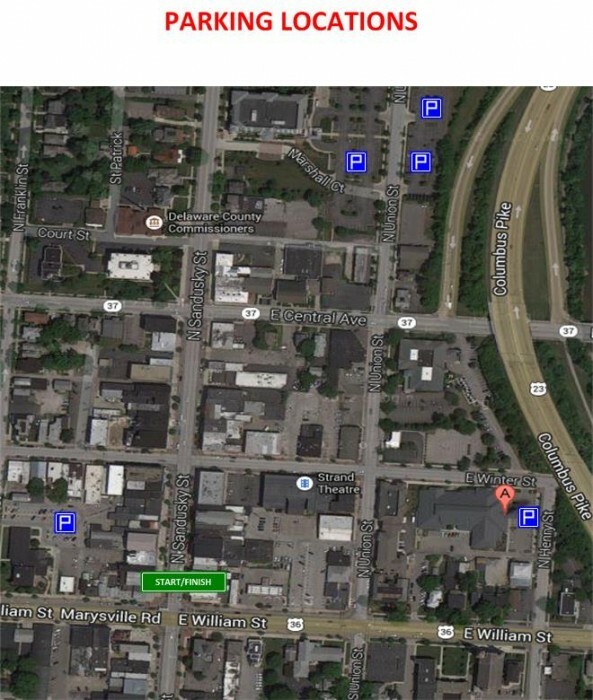 Seven aid stations on course; an aid station at approximately each mile, key spots along the course, and at the intersection of Winter St and Sandusky St for the half marathoners starting their 2nd lap. Fantastic course support led by the community and residents of Delaware, the school system, fraternities and sororities, and more. Entry to the post-race Celebration Block Party, starting at 7:00 pm featuring live music, grilled food, and summer drinks. All finishers will receive a custom New Moon Medal and commemorative New Moon mug. 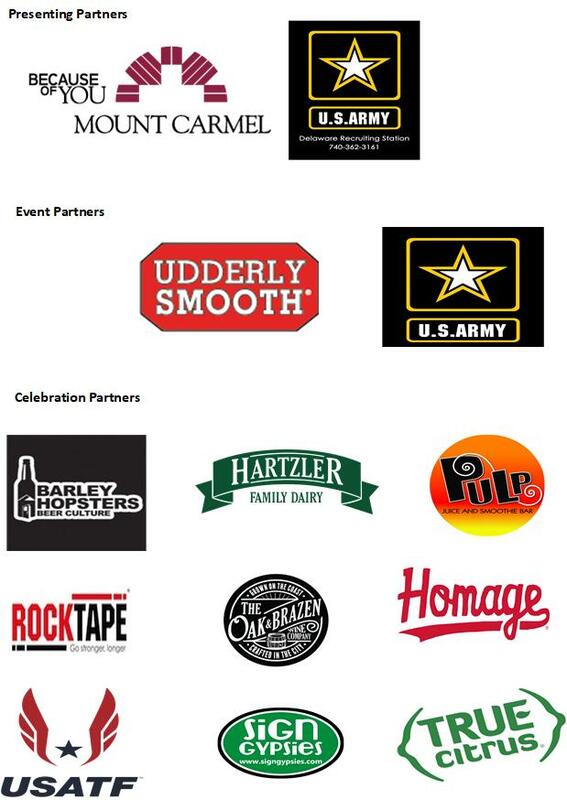 Finishers will be able to enjoy the 1st glass of the summer drink of their choice in the New Moon Celebration Block Party. EVERY PARTICIPANT RECEIVES AN OFFICIAL NEW MOON EVENT SHIRT. We have established a corral system to allow the field of participants to spread out nicely along the course route. We have those who plan to run fastest in the half and quarter marathon towards the front, and those who plan to walk towards the rear. During the registration process, you will be asked to predict your expected minute per mile pace for your respective distance. You can change your corral up to April 15 (bibs are printed after that date). You can always move back to a slower corral on race day if you need to, but you will not be permitted to jump to a faster corral. The corrals will go one after another and your start time will not begin until you cross the starting line. Please bring a household, canned or dry food item to packet pick-up location or to event on race day. We are collecting these items for donation to People in Need of Delaware County. We are also collecting your gently-used running shoes for donation to the Common Ground Free Store of Delaware. Please bring a pair to packet pick-up or check-in to be donated. - Black flag (extreme risk, HSI > 88): If cancellation is not possible participants will be advised of the risks and not to compete. - Red flag (high risk, 80 > HSI > 88): All runners will be made aware that heat injury is possible. Those susceptible to heat will be advised not to compete and all runners urged to slow their pace and hydrate adequately. - Yellow flag (moderate risk, 72 > HSI > 80): Participants with high risk for heat stroke will be recommended that they withdraw. Weather forecasts will be monitored prior to the event paying special attention to the possibility of heavy rain, thunder and lightning, high winds and extreme temperatures. If necessary, athletes will be made aware of these predictions on the Greenswell website and on our Facebook so that participants can properly prepare for severe weather during the race as well as possible course alterations. Severe weather updates will also be sent to participants via email as necessary. The Event Director and Safety Director will monitor the weather and make a decision if any action will be taken to modify the race. Possible changes include: altering the start time for the race or in extreme situations, cancellation of the event. Please listen closely to all public address announcements at the starting line of the race. Visible lightning will cause the race to be postponed for a minimum of 15 minutes. Additional sightings will continue to delay the race in 15 minute increments. If heat is predicted, extra water and hydration stations will be provided to the athletes, both prior to, during and after the event. The medical team will be alerted that athletes may require additional medical attention during and after the event due to the high temperatures. If it is felt that it is unsafe for participants to start the race due to severe heat that race may be suspended or cancelled. Race personnel reserve the right to delay, cancel, or suspend the race due to inclement weather. Participants must abandon the race if ordered to do so the race personnel, medical staff, fire or police officers. IMPORTANT- You will be required to acknowledge the policy guidelines during registration. Race entries and/or Race Bibs can be transferred to another individual up to May 15. No transfers will be permitted after May 15. The individual transferring ("Transferer") must initiate the transfer. This is performed by you (you do not need to contact the race organizer) through the registration system. There is a button located on the main event registration page that initiates the process. Follow the procedures from there. You will need to indicate the individual's email address receiving the transfer. The individual receiving the race entry or bib ("Transferee") will receive a transfer email and must then within 3 days register themselves online. The transferee be required to pay the current event entry fee less credit for transferer's entry fee paid. Additionally, all transfers are subject to an additional administrative fee of $15, plus any applicable online registration service fees. Note: If it is your original intent to Gift someone a registration, please use the Gift Registration feature when you initially register. You are permitted to transfer up or down in distance (example: move from Half to quarter distance) through May 15. If you wish to transfer to another distance you must initiate the transfer. Again, this is performed by (you do not need to contact the race organizer) through the registration system. There is transfer button located on main event page. Any distance transfers "up" to a longer distance will be required to pay the difference between the entry fee paid and the current entry fee for the longer distance selected. There is no refund or credit for transfers "down" in distance. Any distance transfers are subject to an additional administrative fee of $10.00, plus any applicable online registration service fees. There are no injury deferrals for this event. You are able to Transfer your entry or transfer "down" in distance per the guidelines listed above. There are no refunds for this event, No refunds are given for injury, pregnancy, or any other medical conditions. We will provide you a discount of 50% into the next year's New Moon Half & Quarter Marathon or Crescent Moon 5K if request is made within 15 days of the event.